Five unique attractions to visit during Thailand’s short yet much-loved cold season. When thinking about Thailand, the word ‘cold’ hardly comes to mind. However, ask any local and they can tell you that we actually do have a ‘winter season,’ which occurs during the last few weeks of December and runs well into early January. During this time, oﬃcegoers pack jumpers for the workplace, people bundle up in scarves on motorcycles, and megamalls like EmQuartier bring out their giant polar bear displays to get everyone in the winter mood. But let’s face it, joyous festive decorations and a chilly morning breeze can’t always substitute for the real thrills of colder weather. So if you’re looking to experience the true one-of-a-kind spectacle that is Thailand’s cooler season, make sure to check out some of these attractions. Thailand’s Nakhon Ratchasima province is lovingly recognised as the ‘Switzerland of Isaan,’ because it boasts plenty of mountains, towering waterfalls, bountiful orchards and seasonal fog as a result of its cooler climate. The province is also home to the annual Flora Park, a festival that exhibits over 100,000 plant and ﬂower species, located in the picturesque Wang Nam Khiao district. Here, nature enthusiasts can explore ﬁelds upon ﬁelds of vibrant ﬂowers set across various zones showcasing orchids, roses, petunias and begonias, among others. Additionally, the grounds are home to a plant store, a vertical garden that encourages conservation, and an observation tower for panoramic views of the surrounding landscape. Even though the drive up to Pang Ung near Mae Hong Son is a long and winding one, we guarantee that the spectacular landscapes and chilly weather will please anyone seeking more than just a gust of cool air. 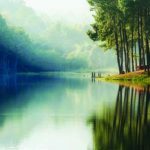 As one of the Royal Initiative Projects set forth by HM Queen Sirikit for highland development, the area’s natural beauty consists of crystal clear lakes, and towering coniferous trees ﬂanked by lush mountains, all of which have been conserved for many years. Its unspoiled beauty creates the perfect destination for nature lovers to set up camp or check into a cabin. Visitors can also indulge in hiking, canoeing, rafting, barbecuing and shopping for local goods. Temperatures often drop below 10 degrees in December, so don’t forget to pack a jacket. Okay, let’s face it: most of us are under the impression that in order to embark on a whale watching expedition, one has to journey to a holiday destination located at the far ends of the earth (Alaska, anyone? ), when in reality, Thailand’s gulf oﬀ the coast of Samut Songkhram province is home to a variety of these gentle giants. The country’s whale watching season oﬃcially begins in October when a small population of Bryde’s whales return to the area to feed on the plentiful plankton. There are currently a number of eco-tours available that consist of a pickup service from Bangkok, and a four to six hour cruise that includes a meal and snacks, followed by a drop oﬀ. Each tour is carried out by marine life specialists in order to guarantee an experience that is both exciting and educational. 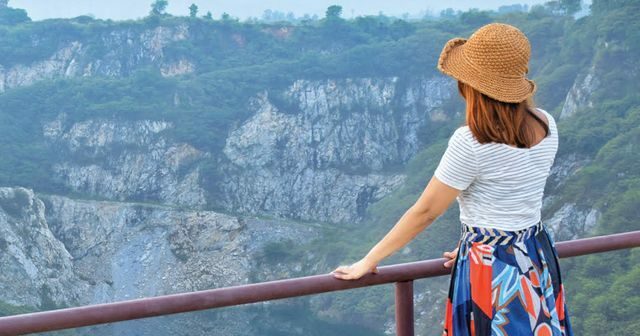 Chonburi’s version of the Grand Canyon is located an hour’s drive from central Pattaya and oﬀ ers some of the most Instagram-worthy spots in the area. The deep canyon gives way to a reservoir of glistening water perfect for photos with panoramic vistas. Sorry to disappoint adrenaline junkies, but entry beyond the viewpoint and swimming in the lake are not permitted. There is also an attraction called Snow Mountain here, which as you guessed, is not made of actual snow. Instead, ﬁne stone material excavated from the Grand Canyon during its creation has been left out in giant mounds that closely resemble the landscapes you would see in blockbuster Sci-Fi movies. Despite their strange appearance, the ‘mountains’ are incredibly fun to climb, especially without the intense heat of Thailand’s notorious summers. 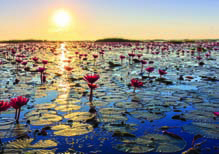 Located in the province of Udon Thani, Red Lotus Lake, also known as ‘Talay Bua Daeng,’ is an attraction that comes to life during the cool months. At this time, tranquil waters are covered in blooming pink water lilies as far as the eye can see, creating a picture-perfect backdrop for photos. However, as the clusters of ﬂowers are quite far from the shore, you will need to hop on a boat to see them at their best. Luckily as the attraction has become quite popular with locals and tourists, both large and small rentals are available, depending on the size of your group, with tours lasting for an hour.